The world is going to come to an end, and Britney Spears intends to dance her way to the apocalypse. 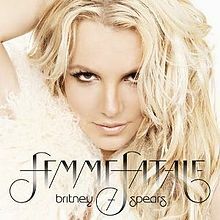 Spears’ latest album “Femme Fatale” is the pop music equivalent of LL Cool J’s “Mama Said Knock You Out”. It’s a game changer for the artist. While many critics are whining that the album never wavers from its dance floor sensibilities, or that the album is more a victory for the producers than for Spears, I see it differently. Thankfully the pop music landscape has changed in recent history, and I think for the better. Thanks to the efforts from female artists such as Lady Gaga, Rihanna, Robyn, and as always Madonna, female driven pop music blends more styles and takes more risks than ever before. Sadly, these innovations made still relatively young Britney Spears something of a pop music dinosaur. Despite her releasing some songs that could compete, overall she hadn’t managed to break through to the new era. “Femme Fatale” rips open with “Till the World Ends”, a pounding booty shaker and it never lets go. The album draws heavily on the ever encroaching electronic/techo sound (Yay!) with a heavy helping of thumping beats. Don’t call it a comeback, Spears could always make you dance, and thanks to her long time producers, everyone is being reminded. Oh boo hoo, it’s a whole album of music that makes you want to dance. What a waste of time that is! You know what, sometimes I don’t want a ballad, sometimes I don’t want to dissect songs for deeper meaning, in short, sometimes this middle aged white girl just wants to feel good, and “Femme Fatale” delivers. The other video I’m going share is for the song “Hold it Against Me”. Let me start by saying, I don’t really care for the video. If you’re looking for an awesome dissection of the video for hidden meaning I have got to send you over to Vigilant Citizen. He explores the ideas of mind control present in the video supported by his thoughts on Disney and Spears’ career. It’s always a good time over there! With all of that out of the way, here are the two things about this video that I want to share. One, watching the video on YouTube was the first time I heard “Hold it Against Me”. While listening to it from the beginning I thought, this is a great dance song, I can’t wait to hear a techno remixer chop it up because that would be awesome. And then at 02:46 it segued into the exact sound I had been hoping for! So a tip of my hat to you noble producers. Second, at that mark starts a sequence that features the generally hokey person fighting themselves scenario. Now I’m not going to proclaim Spears the next female action hero (which was my response to Madonna’s “Die Another Day” video) but thanks to some decent camera work and choreography it looks pretty decent. Also, the close up of her little feet in stiletto heels shuffling for position makes me giggle.